PROTEST AT LAST RINGLING SHOW ON EARTH!! Please join LCA founder Chris DeRose and other activists for a very special demonstration at Ringling Bros. and Barnum & Bailey circus’ last show on Earth! The final performance will mark the end of a cruel era of Ringling breeding animals or stealing them from the wild and forcing them to perform demeaning, unnatural tricks out of fear. On behalf of the animals, we are ecstatic about this victory. 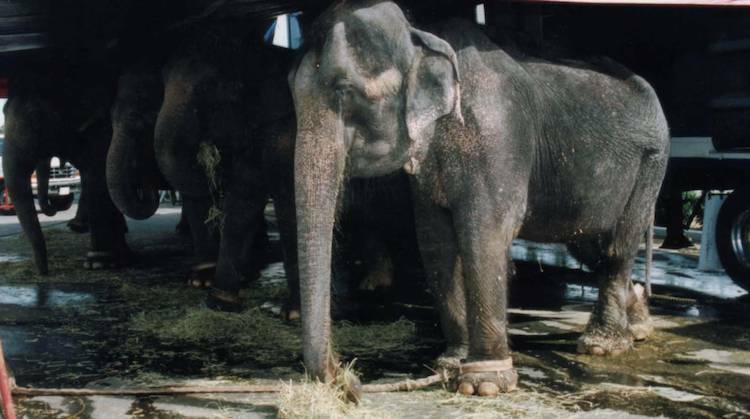 Ringling fought to continue the circus despite continuous exposure of animal cruelty and public outcry. It’s been a long, grueling battle, but LCA always knew that we would prevail and make a difference. The end of Ringling Bros. is a hard-won victory that follows decades of investigations and protests by LCA and other animal advocacy groups. The demonstration at the final show will commemorate the occasion as well as urge Ringling to send the animals to sanctuaries and not sell them to zoos or other exploitative facilities. Join LCA at the Protest at Ringling Bros. Final Performance! Signs and leaflets will be provided by LCA. Can’t make the protest? No matter where you are, please participate in a global toast to mark Ringling Bros. last show! Raise a glass at 9pm Eastern time, when the curtain will go down on Ringling for the very last time. After 146 years, Ringling Brothers and Barnum & Bailey Circus, owned by Feld Entertainment, has announced they are closing down. For decades, LCA has been in the forefront of undercover investigations and nonstop protests that garnered international attention exposing the severe animal cruelty that Ringling tried so desperately to hide. Ringling’s CEO, Kenneth Feld, sent one of his own investigators, Steve Kendall, to spy on LCA President & Founder Chris DeRose. That move backfired as the investigator ended up “flipping” and worked with LCA after realizing the cruelty involved in Ringling’s training tactics. “Anyone that gets in Kenneth Feld’s way, he investigated. Chris DeRose was a threat, one of the biggest. Kenneth singled out individuals that targeted the shows and looked for other ways to combat them, trying to shut down those people and organizations (LCA, PETA) economically,” states Mr. Kendall. Steve Kendall was hired by Feld and worked for him for 8 years gathering information about leaders of the animal rights movement, but ended up helping LCA by supplying intel against Ringling. LCA’s undercover investigator, Bryan Monell, exposed some of the most egregious acts by trainers of circus elephants in the 15 years he worked for LCA, at serious risk to his own life. Succumbing to the nonstop outcry against the use of elephants in the circus, Ringling finally ended its elephant act in May of 2016. LCA, along with dedicated supporters and activists, kept up the fight, demanding an end to the use of all the animals. Because of actions like LCA’s, ticket sales dropped dramatically.